The CFTC is suing popular betting site Intrade. And now Intrade is telling its customers to start shutting down their accounts. ATTENTION U.S. CUSTOMERS – IMPORTANT! We are sorry to announce that due to legal and regulatory pressures, Intrade can no longer allow US residents to participate in our real-money prediction markets. You must close out all open predictions before 8:00am GMT (3:00am ET) on December 23, 2012. Instructions on how to close out an open prediction can be found HERE. If this is not done then by the deadline noted above, Intrade will close out your predictions for you at what we consider to be fair market value as of the daily session close of December 23, 2012. Fair market value will be determined using current and historical price information, including daily close prices and recent trades. Values will be set at the absolute discretion of Intrade and will not be open for review, discussion or argument – our determination of fair market value is final. Please note, no customers will be charged the $4.99 monthly fee due on December 1, 2012. Members have until December 31, 2012, to withdraw all funds from their account. Instructions on how to request a withdrawal can be found HERE. To h! elp you receive your funds as quickly and easily as possible, the $20 fee normally charged by Intrade for processing a bank wire withdrawal will be waived. Please be aware however that any fees charged by the sending and receiving bank, plus any intermediary bank the transfer is routed through will NOT be refunded by Intrade. We understand this announcement may come as a surprise and a disappointment to our US customers, but this in no way signals the end of Intrade in the US. In the near future we’ll announce plans for a new exchange model that will allow legal participation from all jurisdictions – including the US. We believe this new model will further enhance Intrade position as the leading prediction market platform for real time probabilities about future events. We would like to sincerely thank our US customers for their custom, support and loyalty over the years. For our non-US customers, we will continue to offer real-money prediction markets. In the coming weeks and months we plan to implement a number of improvements to the Intrade website. These include expanding our market categories to include sports, adding more convenient funding options and a new and improved trading interface. We’ll keep you posted on these initiatives as they develop. To protect yourself from identity theft never give out your Intrade login or password. You’ve got to be kidding me. The US Supreme Court ruled Wednesday that Congress can remove works from the public domain and re-copyright them in order to bring the the pieces into compliance with international copyright schemes. Yeah, because that doesn’t run completely against the spirit of copyright law or anything. For one reason or another, the American copyright protections of many famous, foreign works—including H.G. Wells’ Things to Come, Fritz Lang’s Metropolis, Prokofiev’s Classical Symphony and Peter and the Wolf, Shostakovich’s Symphony 14, Cello Concerto and everything by Igor Stravinsky—moved into the public domain despite still being copyrighted overseas. To “correct” this issue, Congress passed legislation in 1994 that would move the works in question back to protected status and comply with the Berne Convention, an international copyright treaty. This week, the Supreme Court ruled on a case brought by a coalition of educators, performers, and film archivists who rely on public domain works such as these for their livelihoods. If these pieces are place back under copyright, this group (like everybody else) simply can’t use them. However in a 6-2 ruling—Justices Stephen Breyer and Samuel Alito dissenting—the Court ruled that bringing these works into agreement with the international treaty did not violate the First Amendment rights of those people using the works as they are now (no, those folks will just have to pay licensing fees to perform), nor does it set a precedent for Congress to eventually push for perpetual copyright protections. bestows monetary rewards only on owners of old works in the American public domain. At the same time, the statute inhibits the dissemination of those works, foreign works published abroad after 1923, of which there are many millions, including films, works of art, innumerable photographs, and, of course, books – books that (in the absence of the statute) would assume their rightful places in computer-accessible databases, spreading knowledge throughout the world. Well, well, apparently the Sports Fans Coalition was had some success getting the FCC’s attention about the unfairness that is the most popular sports league in the State’s blackout policy. 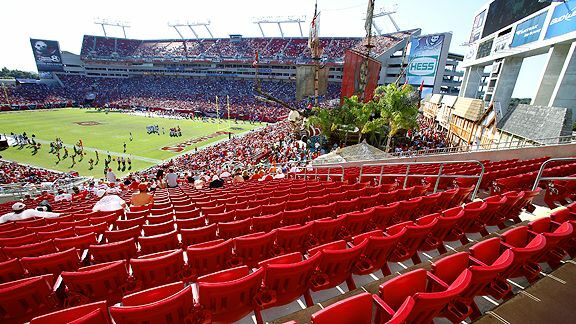 Currently, the NFL rules require any game that isn’t sold out to be blacked out in the home team’s market. The FCC extended that rule from over-the-air broadcasters to cable and satellite since most people don’t get TV with an antenna. This sounds like a good use of the FCC’s time and all, but considering FOX, CBS etc own the rights, we don’t see how removing this rule would change the NFL’s mind on its blackout policy. We suppose it’s possible that publicity from this type of deliberation from the FCC could spur bigger change from the NFL or even Congress, but considering the success of the NFL, this might not end peacefully. Sports Fans Coalition motivated the FCC to review its NFL blackout rules originally appeared on Engadget on Thu, 12 Jan 2012 21:42:00 EDT. Please see our terms for use of feeds. 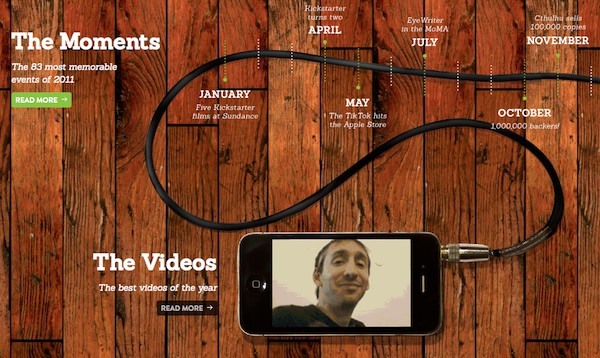 Just how big a year was 2011 for Kickstarter? Very nearly a $100 million dollar year. That was the total amount of funding pledged on the crowd-sourced site during the year ($99,344,382, specifically), which is up considerably from the $27.6 million pledged in 2010. That was generated by just over 27,000 projects, 11,836 of which reached their funding goals (a success rate of 46%, up from 43% in 2010). What’s more, while tech-related projects may generate the most attention ’round these parts, film and music projects were actually the two biggest cash draws on the site (netting $32 million and $19 million, respectively). Hit the source link below for the company’s complete wrap-up. Kickstarter details the year that was: 27k projects, almost $100 million in funding originally appeared on Engadget on Wed, 11 Jan 2012 01:10:00 EDT. Please see our terms for use of feeds. The walls of Las Vegas casinos — devoid of clocks and windows — form chambers in which time loses its mastery over the existence of those who dwell within them. So is it too for the products on display at CES, which run the gamut from things currently in stores to concept products that may not materialize for years, if ever. Nonetheless, with Mobile World Congress and the CTIA Wireless show still vying for the attention of handset introductions and Apple and Microsoft relying more on their own events for major PC OS announcements, television remains a staple of the show, with nearly all major U.S. brands having a presence on the show floor or off-site. 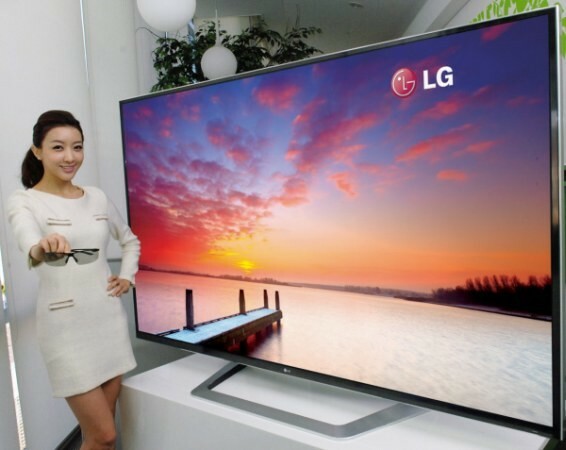 At CES 2012, one can surely still expect a lot of focus on 3D television. Increasingly, though, three other “D”s are coming to represent the direction of television. Switched On: The Three Ds of CES TV originally appeared on Engadget on Sun, 08 Jan 2012 09:30:00 EDT. Please see our terms for use of feeds. There are lots of third-party guesstimates floating around about Google+ traffic. Are users losing interest like search trends seem to show? Has the service grown to 150 million active users like this research firm thinks? I’ve gotten new numbers from comScore, which is arguably the best third-party measurement firm for web traffic in the world. It shows that Google+ grew from 65 million unique visitors in October to nearly 67 million in November. This is purely based on traffic to the plus.google.com subdomain, comScore’s Andrew Lipsman tells me today. So it doesn’t include the many Google+ feature injections that the search company has administered to its other properties over the last months. Some people have suggested that Google+ is as barren as a desert — this is at least an oasis. Here’s how the service stacked up against competitors last month. The depressing significance for those people out there wishing for Google+ to either die off or kill their rivals is that neither appears to be happening. Just some slow and steady growth, which is overall good for Google considering the vast resources and focus that it’s bringing to bear on the effort. Ultimately, Google+ doesn’t have to dominate now, it just needs to keep growing and getting better over the coming years in order to be a real alternative to Facebook and everyone else. And now, the usual data caveat: Obviously comScore, like any other third-party, doesn’t have the same access to data as Google itself, so don’t assume these numbers are 100% right. But still they’re worth paying attention to, since Google doesn’t share much about how it’s doing. The last time the company released anything, it said it had 40 million registered users during its earnings call in October. That’s not directly comparable to this, but could indicate that there’s been more significant growth over the fall. Also, for more on worldwide social networking trends, check out our coverage of comScore’s 2011 social report from yesterday. Google announced on Friday that it has purchased the music licensing company RightsFlow for its detailed information about who should get paid when any of over 30 million songs get played. Neither Google nor Rightsflow would comment on the deal beyond their official statements, but we have pieced together some of the reasons Google would purchase a music licensing company like RightsFlow, which deals with “mechanical” royalties owed to songwriters, publishers, and other copyright holders. They whenever a non-human thing – like a compact disc, website, or music app –plays music. RightsFlow, pictured here, now belongs to Google, which will use it to simplify royalty accounting on YouTube and possibly other music services. The big reason Google would do this is that YouTube continues to be such a massive free music destination. It simply made more sense to buy RightsFlow outright to help keep its administrative and legal costs down, than to continue to rely on its services alongside other RightsFlow clients such as Rhapsody. To be clear, this doesn’t give Google any rights to this music; it just makes those rights easier to deal with. The acquisition, announced on Friday (when companies typically announce stuff they don’t want people paying attention to) is more evidence that Google is serious about YouTube as a free music destination. It should now be able to add even more music without worrying as much about lawsuits or expensive accounting. Once Google has identified songs uploaded to YouTube using its Content ID fingerprinting technology, it should be able to figure out more easily which publishers and songwriters to pay. This could also help Google deal with its Google music store or other Google stuff in the future, although for now, Google’s focus for this deal is squarely on YouTube. RightsFlow, recently named the #8 most desirable place to work in New York by Crain’s New York Business, owns information that is mostly publicly available. What makes it valuable is its ability to search all that data, making it easier to license lots of songs at once. So, basically, Google just acquired a search engine, sort of like Google itself – except now, it could just have just one (admittedly very busy) user. Evolver.fm observes, tracks and analyzes the music apps scene, with the belief that it’s crucial to how humans experience music, and how that experience is evolving. Tumblr has been in the news a lot recently because of their huge user numbers (there’s also been some question of whether or not they are a “bot fest” – but I’ll leave that for others to analyze.) Back in 2009, I compared Tumblr to Posterous – but since that time Tumblr has just pulled away. So much so that Posterous seems to have seen the writing on the wall and is now pivoting in a new direction. But I thought it would be good to take a look at how Tumblr fairs against the larger, more established blogging networks – namely WordPress.com and Blogger.com (now part of Google). In terms of unique visitors, there isn’t any comparison – WordPress continues to dominate. Blogger has seen attrition in their numbers and has now fallen to third place (maybe the recent move to integrate Blogger into Google+ will help here). In terms of visits, while Tumblr passed Blogger more than a year ago, it has now moved into a tie with WordPress. But while Tumblr has many fewer unique visitors, those visitors are viewing a lot of pages. In fact, Tumblr is now completely dominating WordPress and Blogger in this area. And in terms of attention, Tumblr is once again dominant. 1. Tumblr functions more like a social network – thus people that use Tumblr tend to also subscribe/follow other Tumblrs – creating a strong network effect. 2. Cross-blog tagging – this brings a bit of Twitter to the blog network – allowing people to easily aggregate content, by tag, across blogs. This also, no doubt, aids in content discovery. 3. Tumblr reduces barriers to publishing content – unlike a traditional blog, where people feel the need to provide richer content, Tumblr tends to encourage simple posts. What do you think? Are you using Tumblr now in place of other blogging networks? How do you decide which one to use, and for what purpose? At yesterday’s Kindle presentation, Amazon CEO Jeff Bezos gave special attention to all the people in the media who were calling for a $99 Kindle. 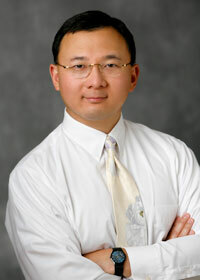 He noted that pundits said a $99 Kindle would send people into a “fervor”. Then Bezos whipped out a $99 Kindle Touch and said the “fervor” for cheap Kindles could begin. 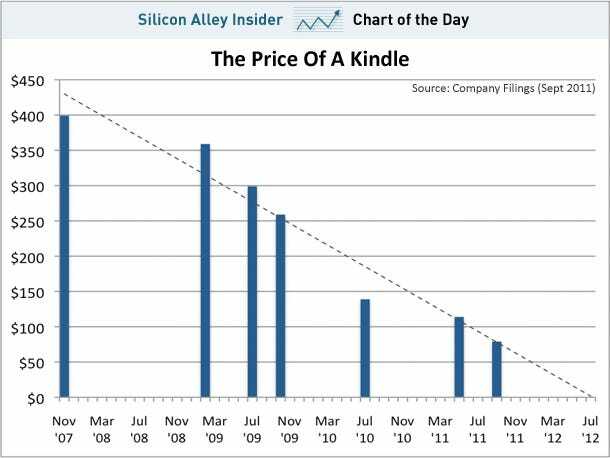 We’ll start the next round of questions from the pundits to Bezos: When will the Kindle be free? When will Amazon’s special offers, and Prime program make it cheap enough for Amazon to give away Kindles? Next year? The year after that?